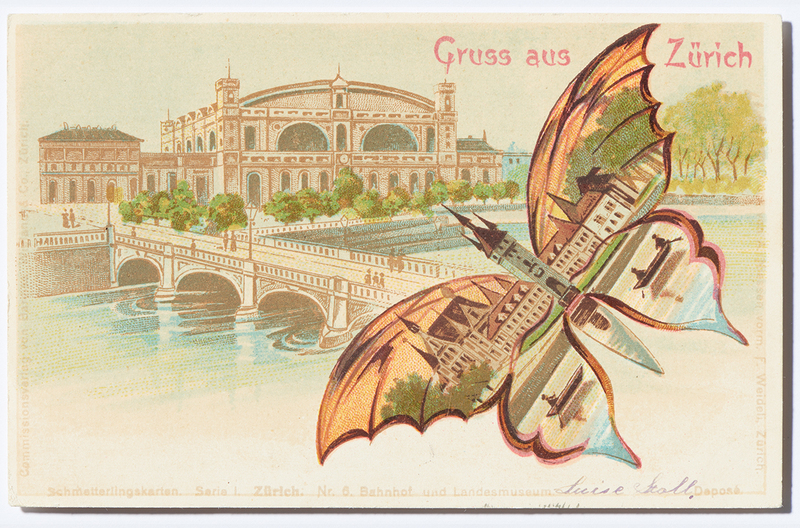 Postcards were already becoming illustrated in the 1800s. 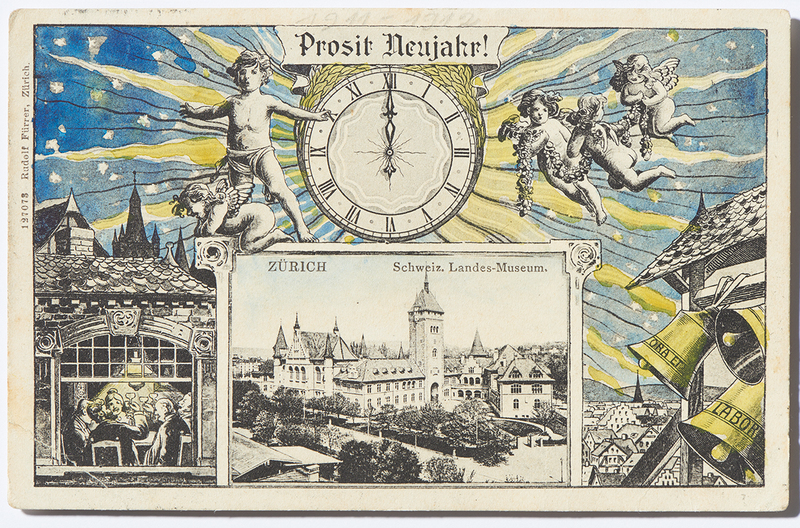 Shortly before the turn of the century new printing technology made it possible to mass-produce pictures on greeting cards at reasonable prices and soon in colour as well. 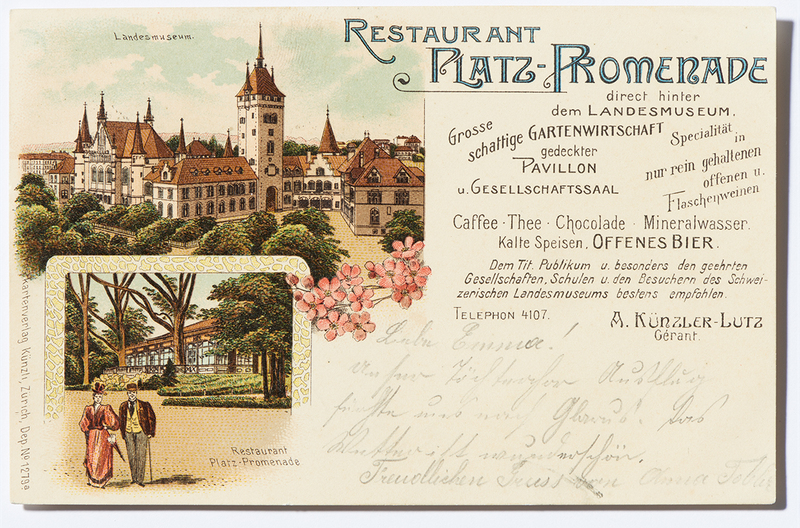 As people began to travel more, and as tourism flourished, the market for picture postcards exploded. 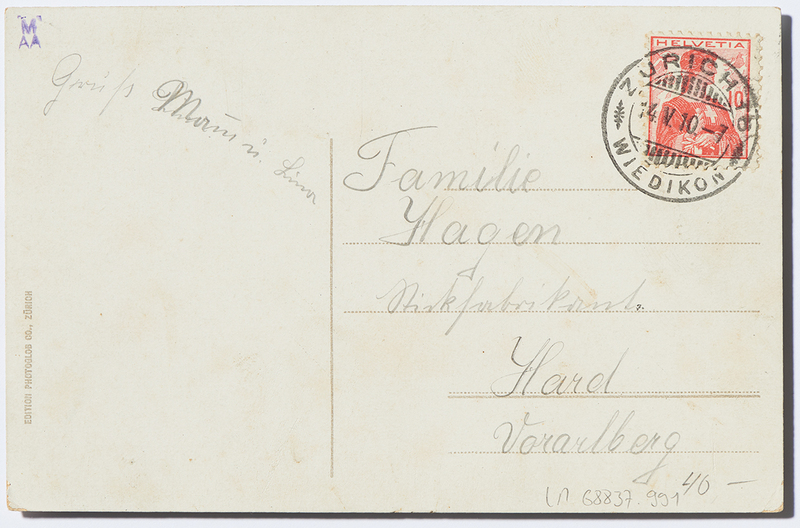 Greetings from holidaymakers and well-wishers on special occasions were sent by the millions. 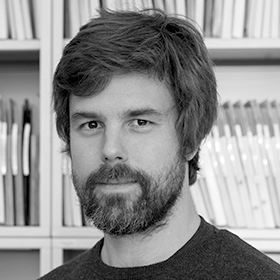 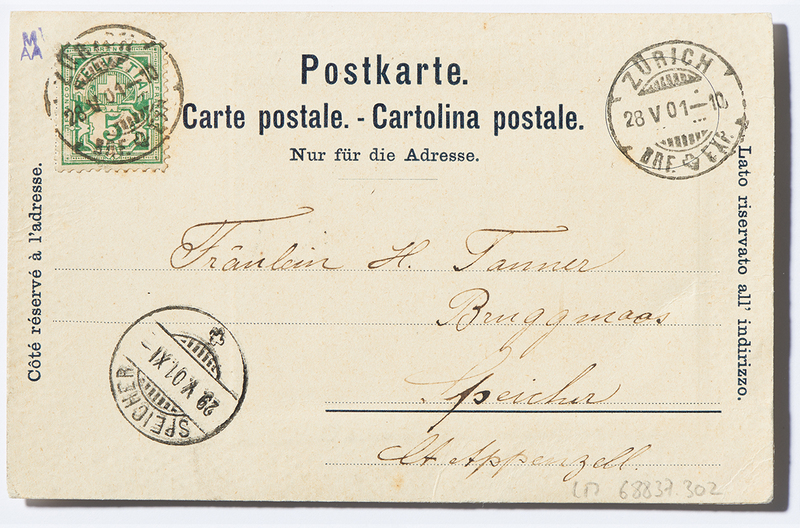 But often people wrote simply to ask how the recipient the was doing or to satisfy their own need to communicate—a bit like in text messaging nowadays. 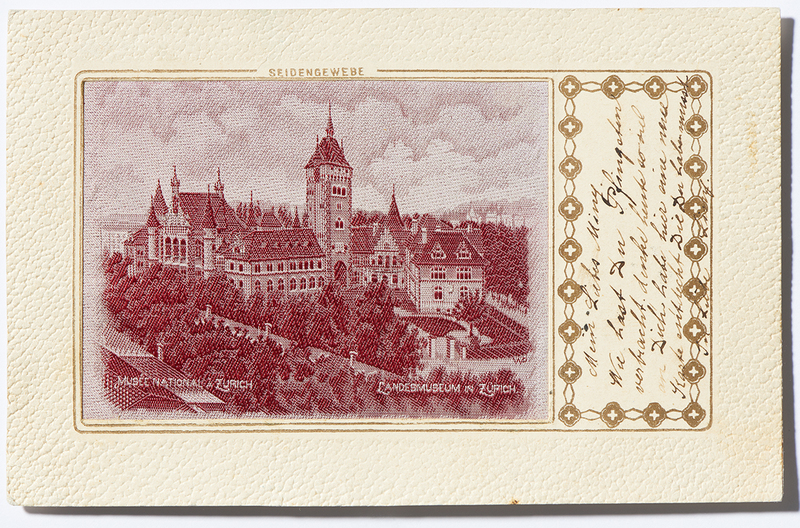 In addition, pretty cards gained status as collectors’ items and souvenirs at a time private photography had not yet taken hold extensively. 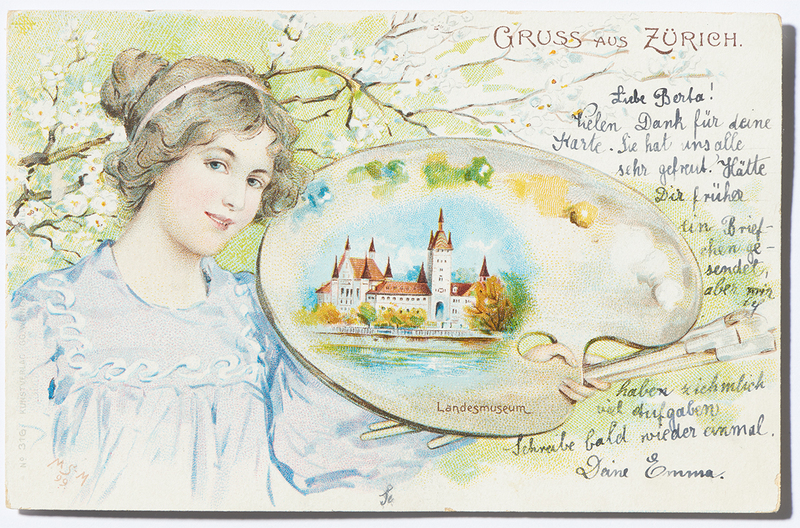 The «golden age» of postcards ended after the First World War with the advent of new means of communication such as the telephone and amateur photography. 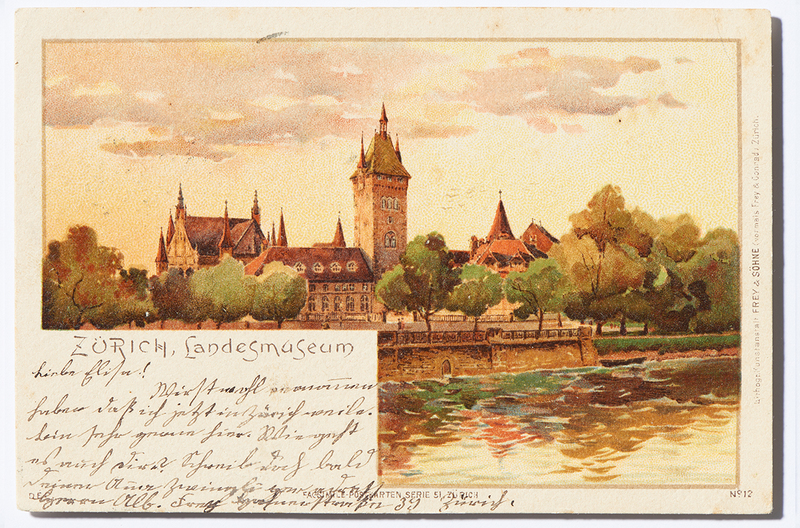 The subjects of illustrated postcards covered a broad spectrum, although they were dominated by topographical features such as city landmarks and picturesque landscapes. 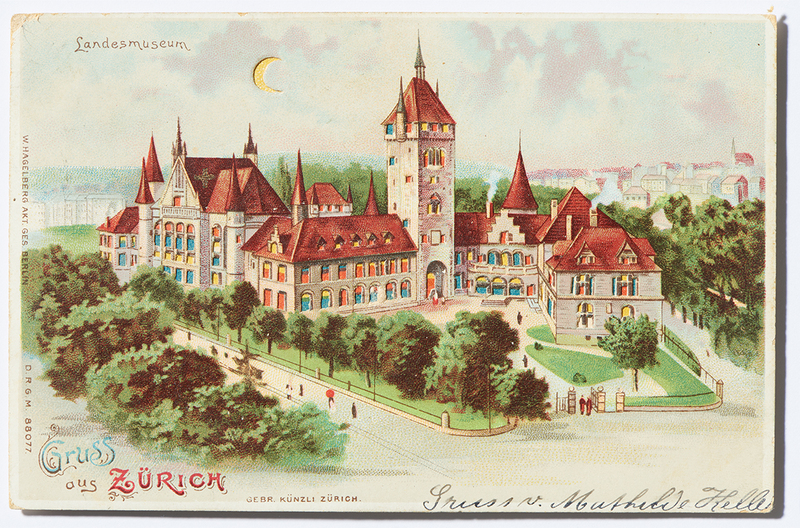 With its spectacular architecture the National Museum, newly opened in 1898, was predestined for this role and so was frequently captured on postcards in a wide range of variations. 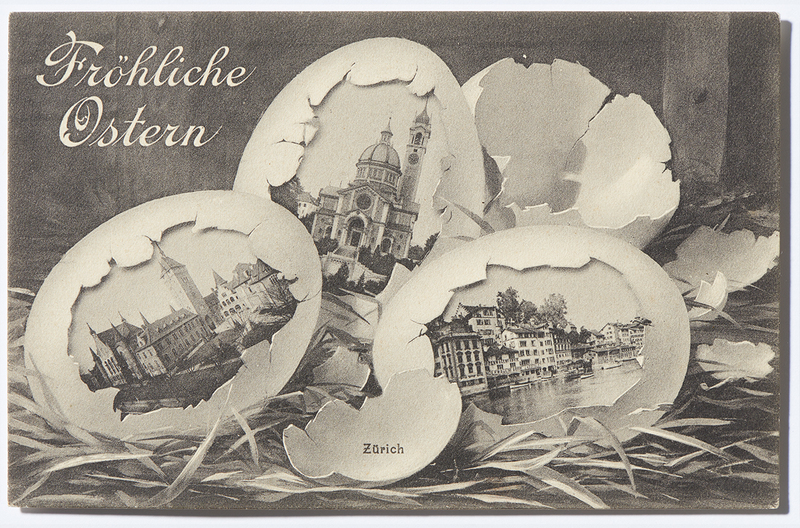 As demonstrated by the examples, however, the text often had nothing to do with the picture: people merely chose an aesthetically pleasing card as a vehicle to convey their message. 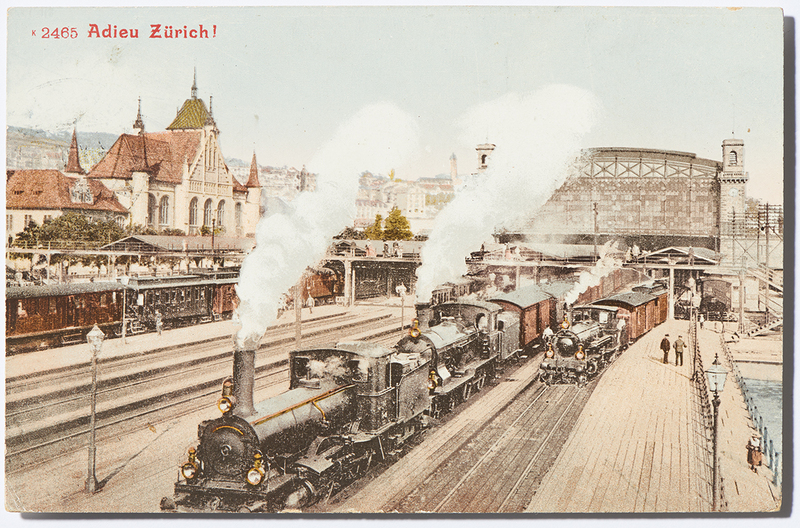 And as we can also see,1905 brought a technical innovation. 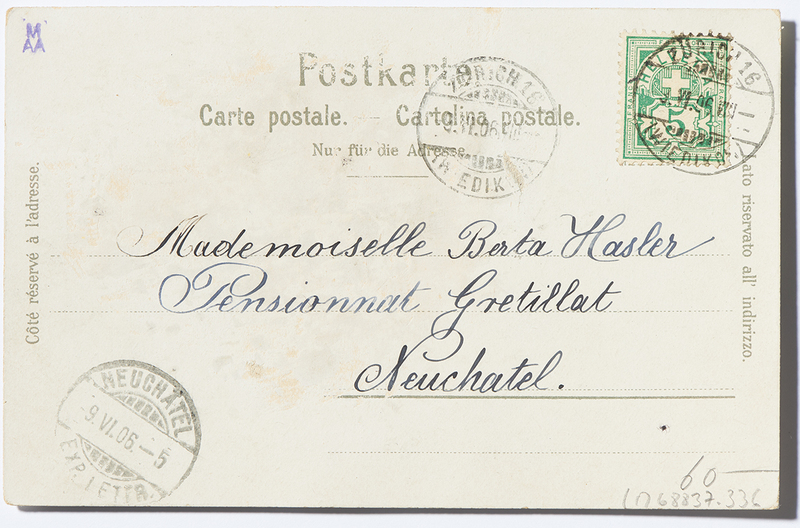 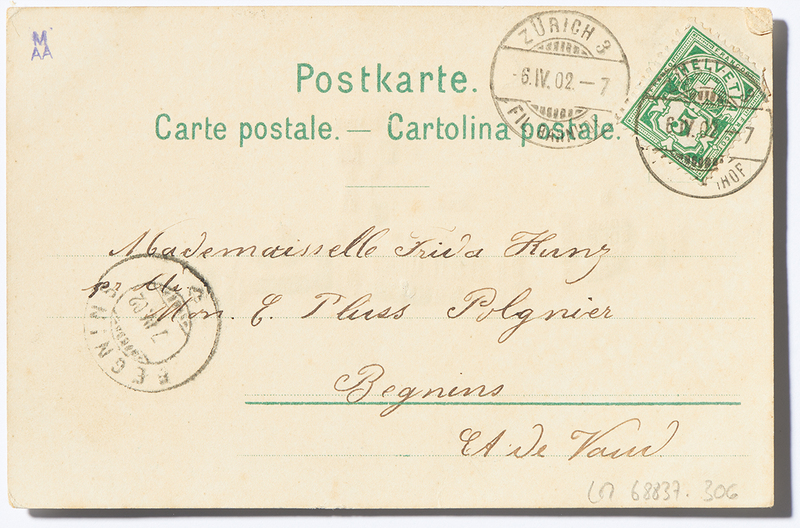 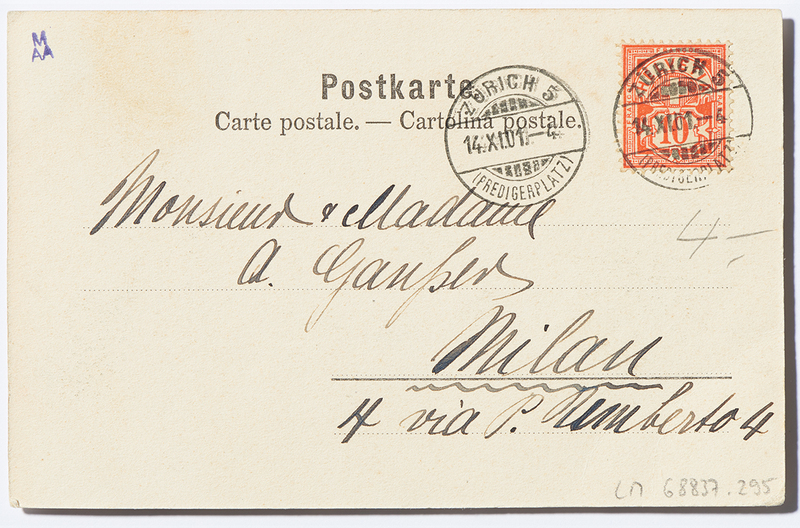 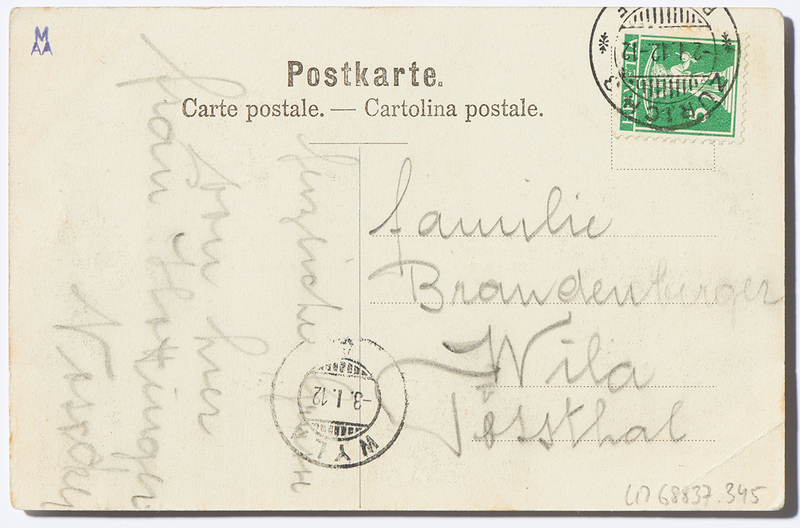 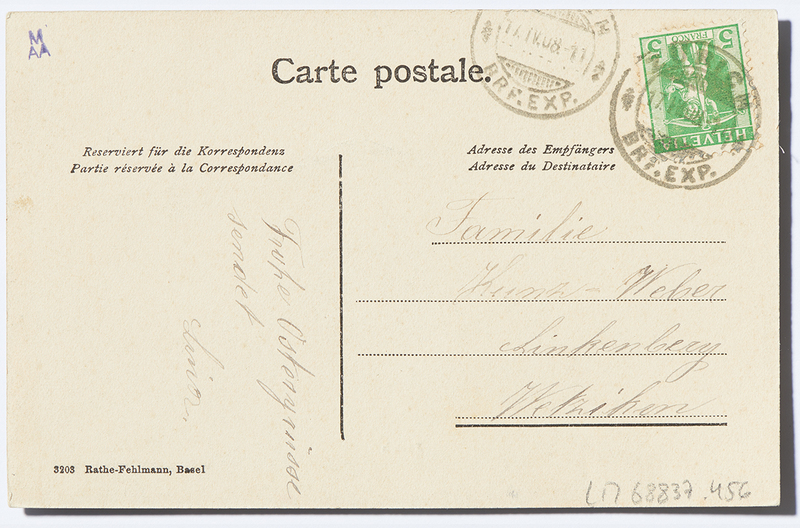 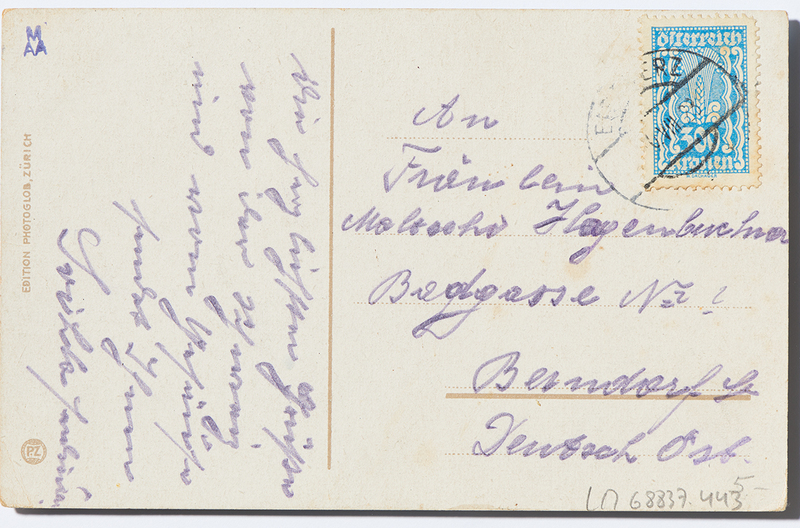 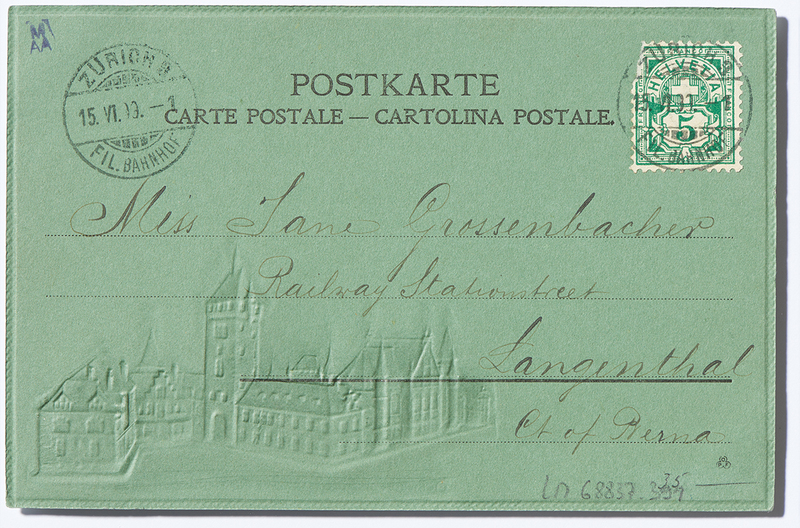 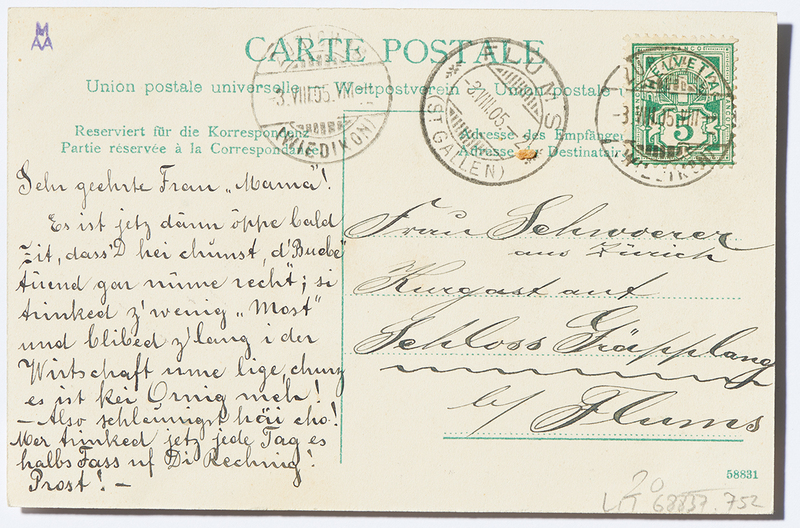 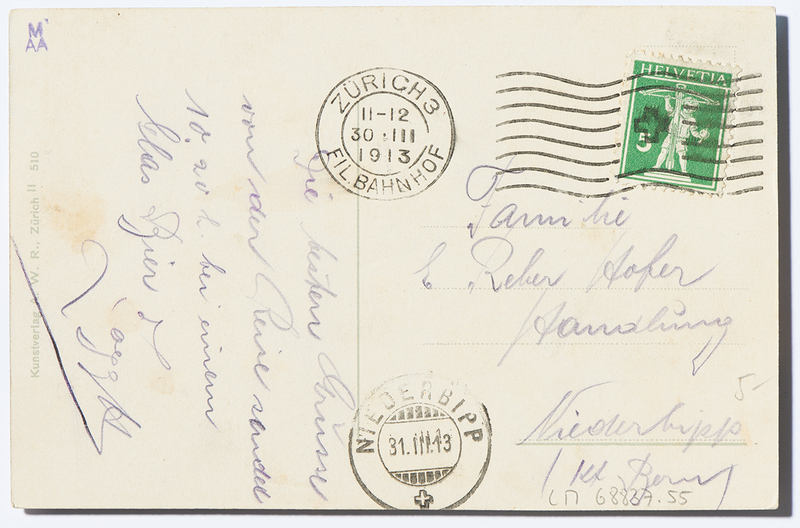 Until then the reverse side of postcards had been reserved for the address, and even writers skilled in using small characters had increasingly had to accept the predominance of the illustration on the front side. 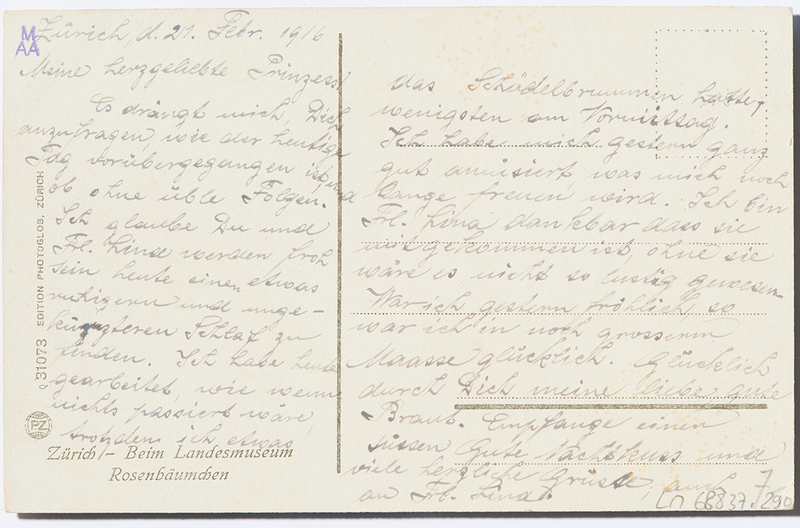 But from this point onwards the rear side was divided into two sections, one for the address and the other for a message, whereas the front side remained only for the full-format picture. 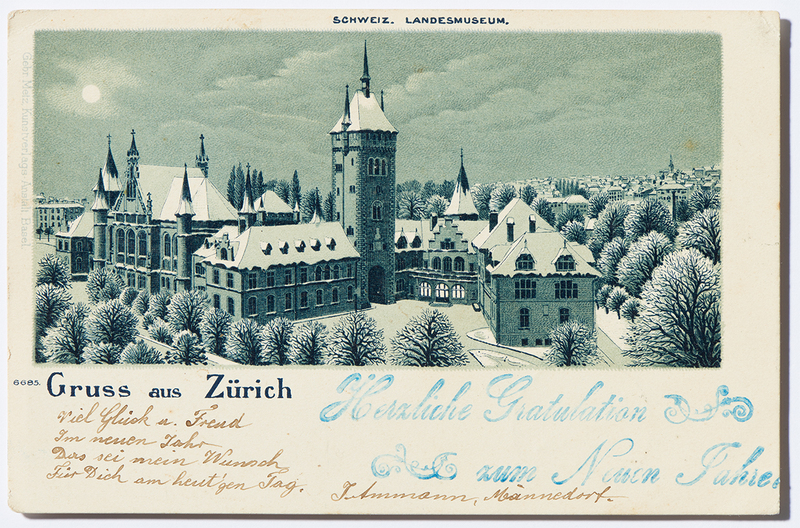 The Swiss National Museum in Zurich was inaugurated on 25 June 1898. 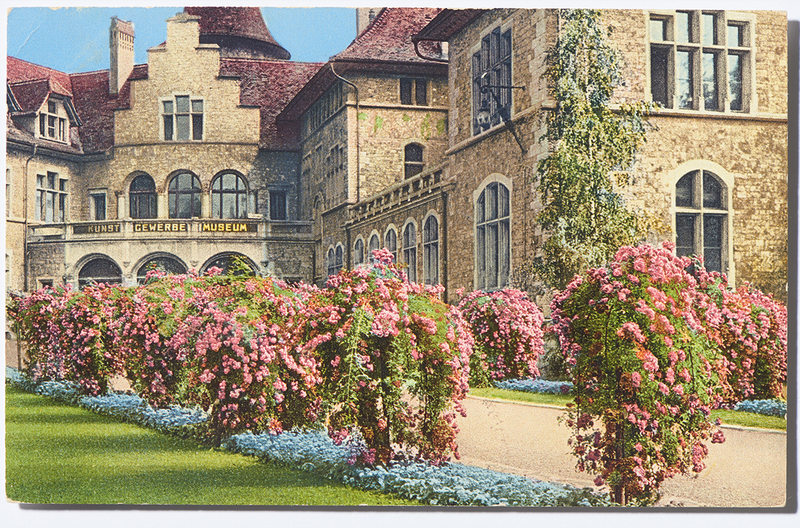 To mark this anniversary, we propose a week-long look back at episodes in the institution’s 120-year history. 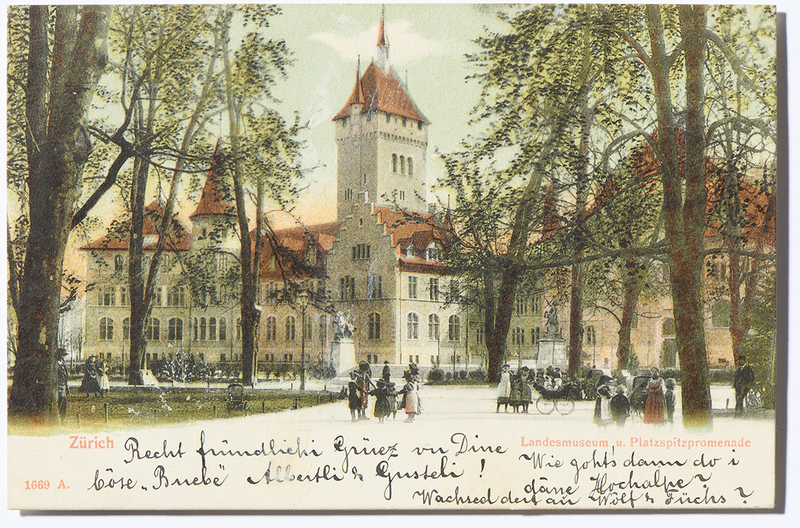 The three-day opening festivities culminated on the afternoon of 25 June 1898 with a lavish celebration parade through downtown Zurich. 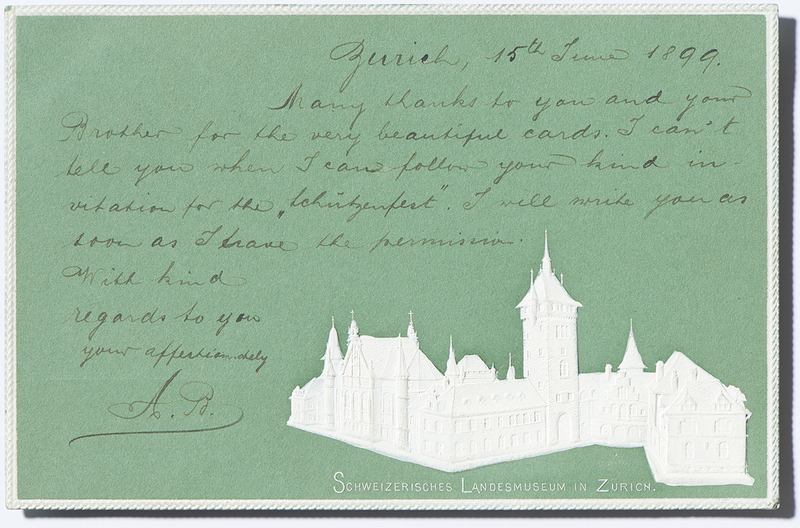 On a tour of the recently opened National Museum around 1900, visitors were mainly impressed with the spectacularly fitted-out exhibition halls. 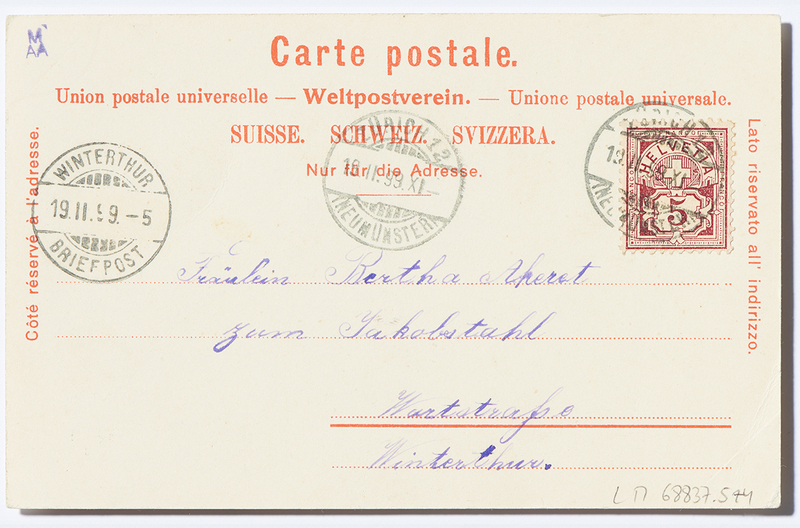 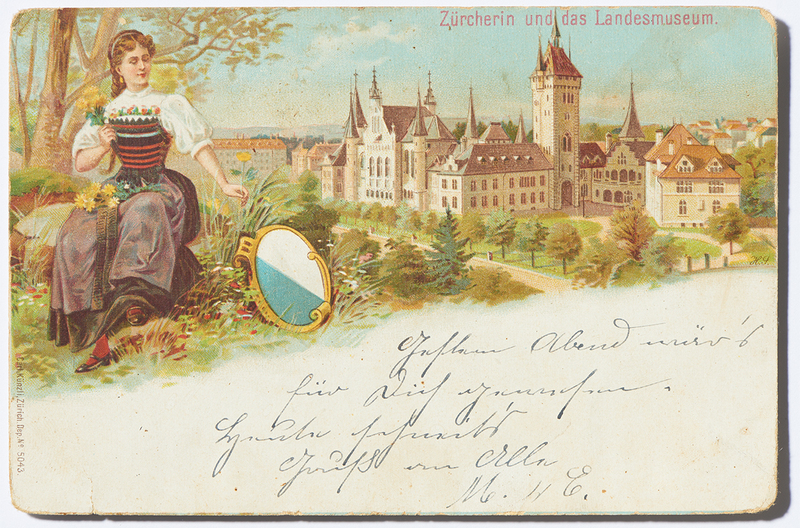 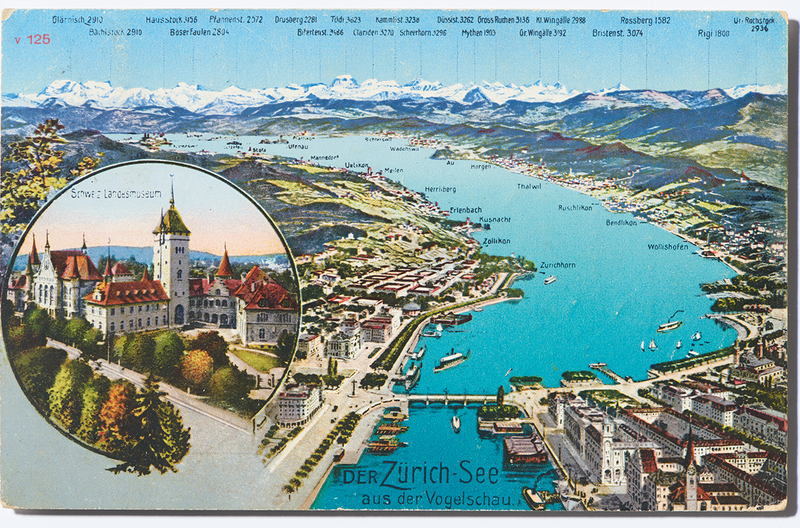 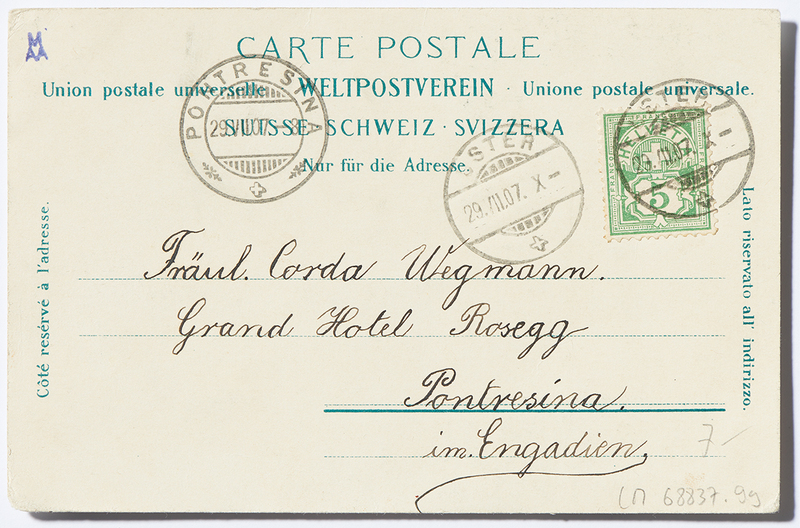 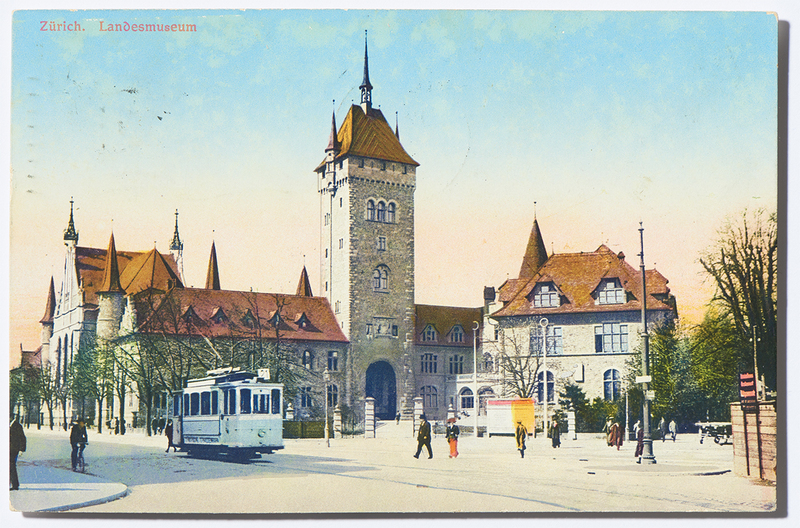 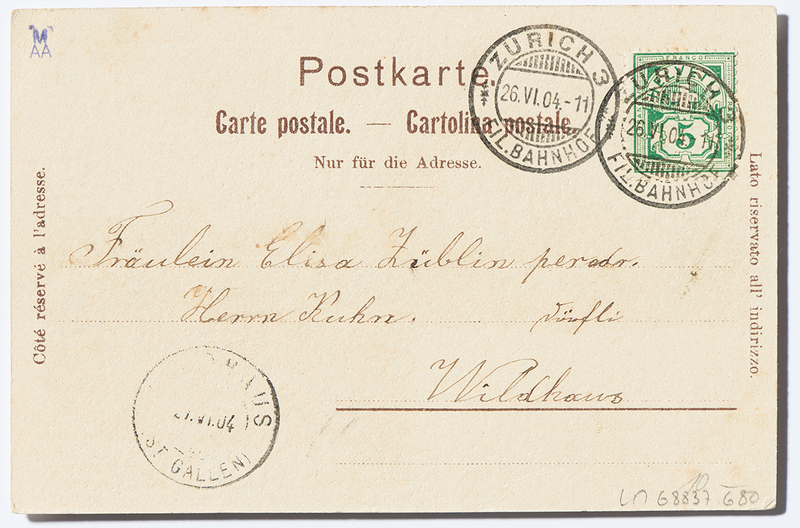 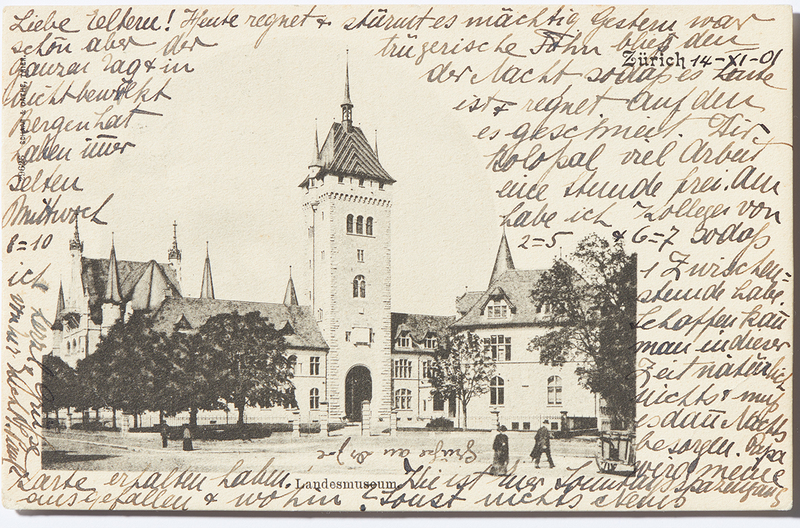 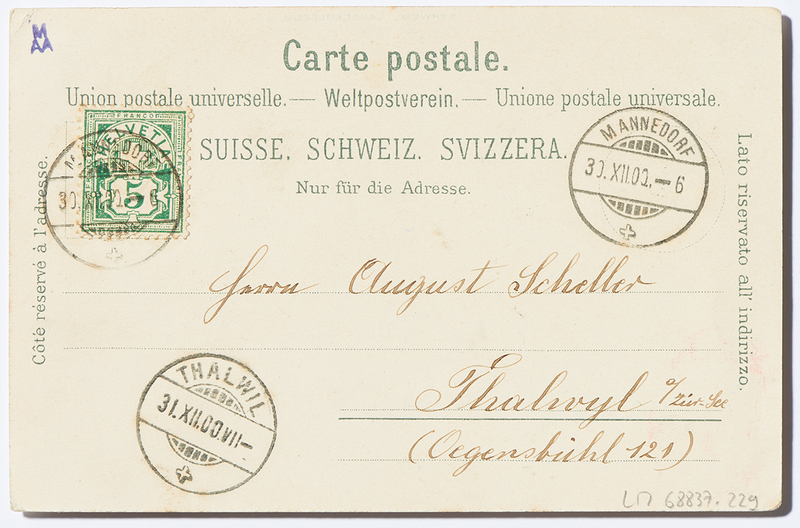 As a Zurich landmark the National Museum was a greatly appreciated opportunity to write postcards, which were sent by the millions. 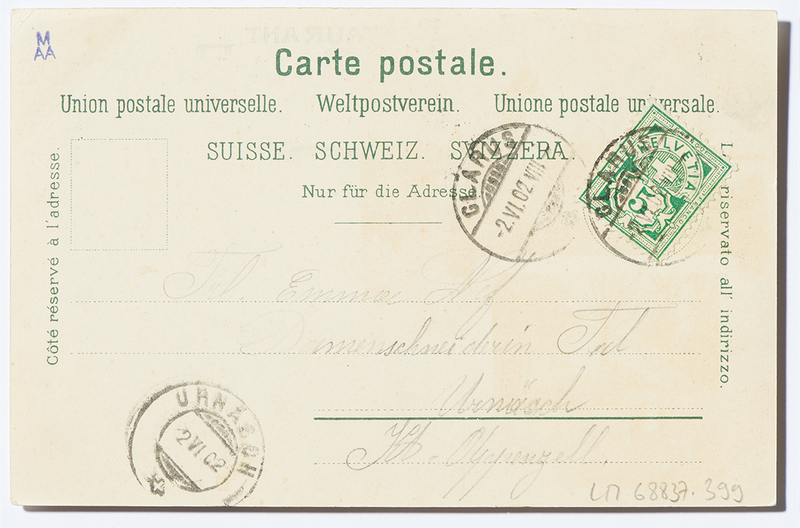 A look inside the museum’s offices, workshops and collections in the 1970s. 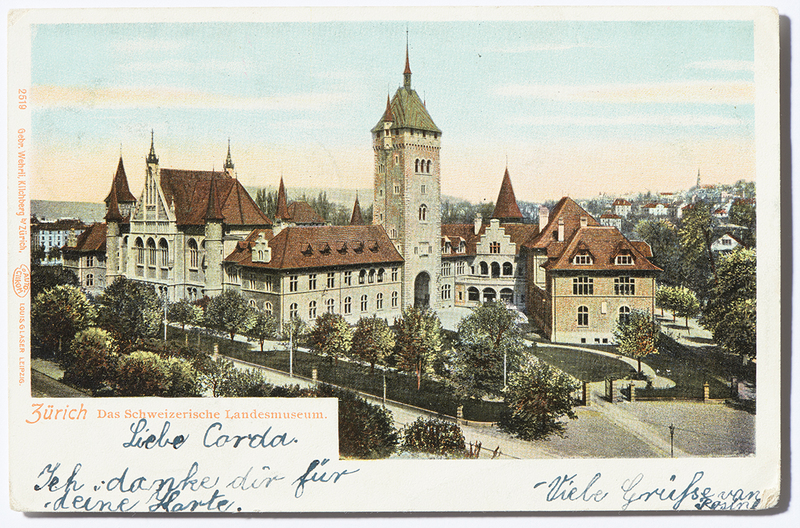 An enlargement was already planned when the National Museum was opened in 1898. 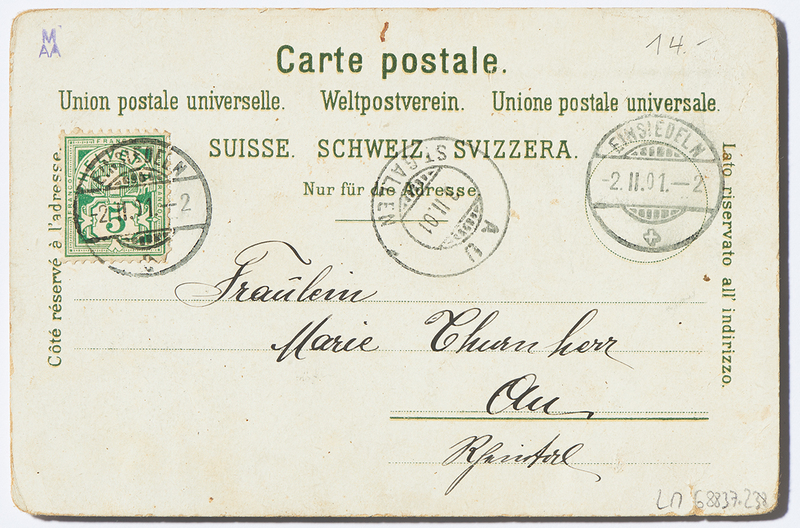 Only 118 years later was the project fulfilled.